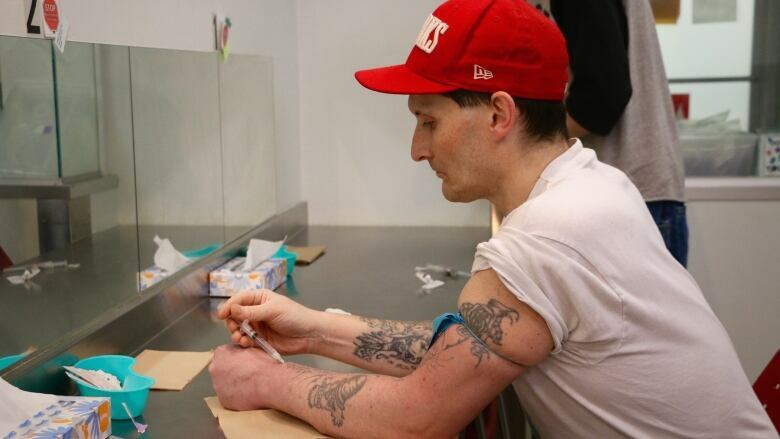 A limited program run out of Vancouver's Downtown Eastside has about 130 people receiving injectable opioid treatment, but its operators say it could immediately expand, if given the green light. Mark Schnell walks into the injection room at Providence Health Care's Crosstown Clinic in Vancouver's Downtown Eastside. With the help of a cane, he approaches a booth where he's given one of his three daily doses of injectable hydromorphone, an opioid used as a replacement for drugs like heroin. The 49-year-old makes his way over to a steel counter in front of a mirror, where a nurse helps him wrap a piece of elastic around his upper arm. He struggles to find a vein in his left hand, then suddenly cries out in pain. Another nurse jumps in to help him. "I hit a nerve. It was an electrical shock through my whole body," he later said. "I've never experienced anything like that." Schnell tries a vein in his other hand, then decides to inject the drug into his right shoulder. For nearly three decades, Schnell has used hard drugs. For most of that time he was into crack cocaine and crystal meth, but by the time he got into the program at Crosstown about four years ago, he was also dependent on heroin. "Being in this program, the first thing I did ... I quit cocaine after 28 years," he said. Schnell is one of about 130 participants in the program. About 100 patients are prescribed heroin, the rest receive hydromorphone. 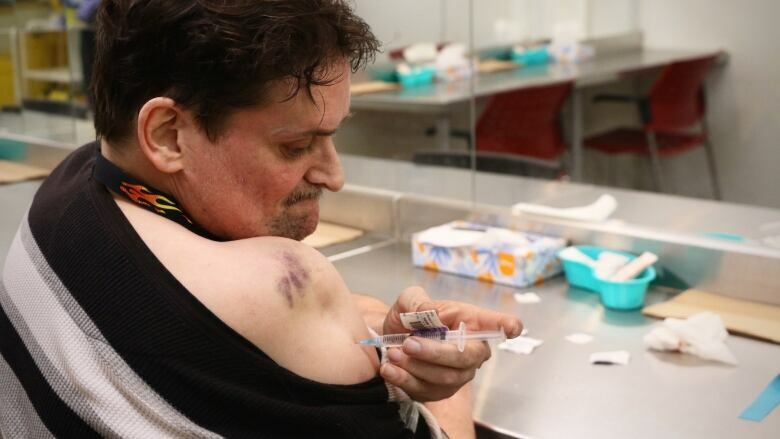 Prescription heroin has been pointed to as a potential fix for the fentanyl overdose crisis that has been ravaging the Downtown Eastside, and affecting people across the province. The drug epidemic killed 914 people in British Columbia in 2016, according to officials. Crosstown lead doctor Scott MacDonald argues its success should be leading to expansion. But the idea of giving addicts free drugs to inject into their veins is one that gives some people pause, and policy makers have not been quick to adopt injectable therapy as a solution to the overdose crisis. The federal government overturned a ban on prescription heroin in September, but in a recent interview with CBC, federal Health Minister Jane Philpott said provinces, including B.C., "have not used that opportunity to provide treatment to the people that need it." B.C. 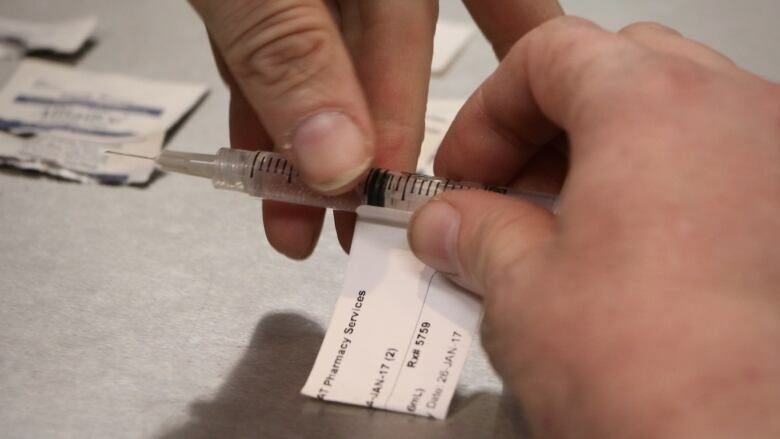 Health Minister Terry Lake told CBC's The Early Edition, "We don't have physicians that are capable at this point in time in numbers large enough to administer injectable, pharmaceutical grade heroin and finding those particular people that would be helped by that is not simple." MacDonald, said there are another 350 people who have already been screened and would benefit from the treatment. He also said the pharmacist on site could easily accommodate more patients, and clinics could be quickly set up elsewhere; all that would be needed is a room and funding for a nurse. For Schnell and the others in the program, the urgency of the opioid overdose crisis couldn't be any more obvious. "I feel guilty. I feel guilty that I have this and I don't have to worry," he said. "I have one less friend now than I had two weeks ago," said Schnell. "If he had been in this program, he would be alive today, as I am." The Fentanyl Fix is a week long series exploring potential solutions to B.C. 's opioid overdose crisis.